Rabbit Stew: Weight Gain and Shotguns in Rugeley. I was doing the rounds of the charity shops in the nearby town of Rugeley yesterday, still looking for interview-wear, when I stuck my head into the tiny, packed-to-the-roof-beams gun shop there and found that there were about a dozen big sheets of white cardboard propped up on the floor, each with hundreds of little holes in them. 'I've put on weight', said Ray the owner. 'Well...', my putting it this way didn't quite hit the mark, 'sort of...'. Eventually, he managed to explain it to me. He'd noticed that his shooting had become less accurate in recent years and he'd struggled to understand why. Recently it had occurred to him that this might be related to him having put on some weight - that the stock of the shotgun might be sitting a little bit differently against his now slightly chubbier cheek. 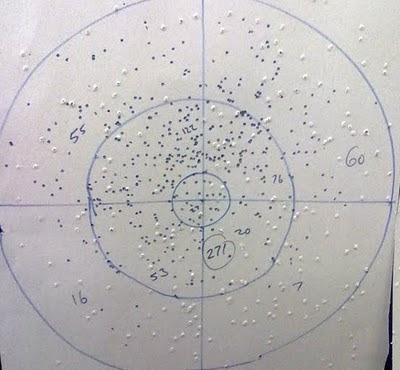 This, he reasoned, might have shifted the angle of the gun in his grip and therefore had an effect on the spread of pellets in and around the target zone. So he now had to alter his gun so that he was hitting the bulls-eye again. You don't do this with shotguns the way you would do with an air rifle, , he told me - that's to say by fiddling with little dials on the scope - you do it instead by altering the way that the gun itself sits against your shoulder and face. 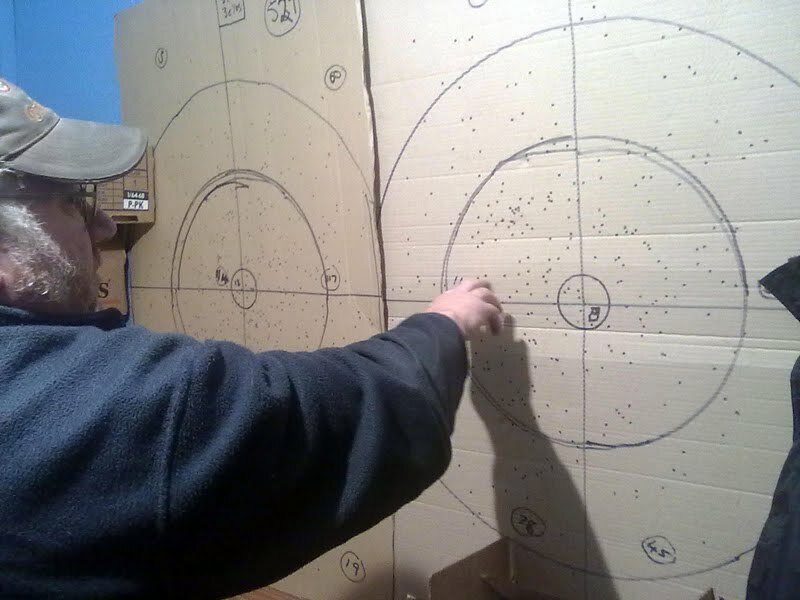 The cardboard sheets were the evidence of the shots he'd taken after making changes to the cheek-piece of his gun, tuning it, in effect, to try and bring the area of maximum pellet density back to the centre of his aim. He'd finally settled on one set of changes after he'd begun to consistently produce sheets with more balanced patterns. 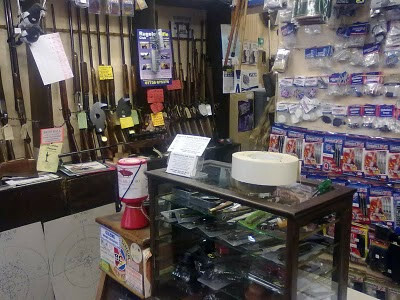 I felt rather privileged to go into a gun shop and be involved in a conversation like this. Ray was happy to talk to me about it and pleased that he'd hit on a way to make his shooting more accurate. 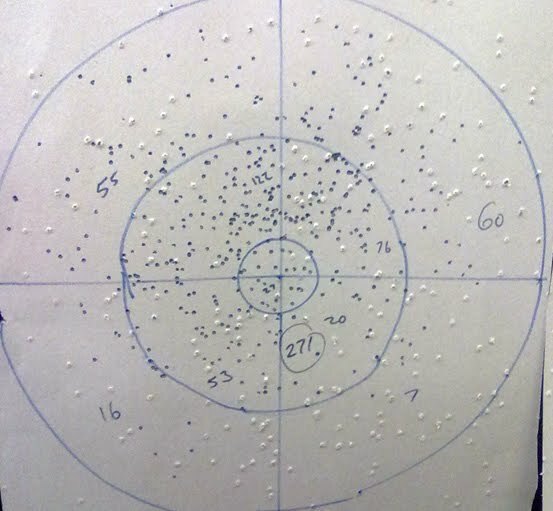 I've been doing more shooting practice myself recently, trying to improve my accuracy as well, and it was a real pleasure to come across someone with some of the same preoccupations, someone who's engaged with the same set of questions and challenges as I am myself. If he were to lose weight, he could leave the gun as it was, and probably live longer and get in more shooting. His choice makes no sense to me. You will have more chance of platting fog than Ray loose weight. He likes the odd pint after work and he is not built for jogging. He is a good chap though. Well, I know what you mean, Le Loup, but my jogging shoes are gathering dust in the closet and my waistline is is not the same size as it was in my teens. It's tricky, do I by trousers that fit me now or will fit me at the end of my fitness campaign which I'm going to start...well, tomorrow (maybe). Hey Eddie. Yep, he's a good bloke. Head on gun, have more fun. I make it a practice to bend every stock I own to fit my line of sight. Your friend is taking exactly the right steps and I admire him for recognizing that his gun fit will adjust as his physique changes. Adjusting the pattern so the gun shoots where you're looking is critical to successful bird or rabbit whacking. Besides, if you know for sure the gun is shooting where you're aiming, you at least start out with confidence. That's half the battle. That's the beauty of subsistence hunting: When you get too successful and the potentially unhealthy weight sets in, nature steps in to help balance things out. Can't get up that hill fast enough? Can't get your gun to shoot straight? Welp, ya go without for a week or so until you are back to your svelte hunting figure. A double gun...like a good suit, needs to be fitted!